We are working on our sand unit study and one of the things we have been learning about is glass...because glass of course is made out of sand. 1.First go on a glass treasure hunt. **Parents make sure you explain how dangerous glass is and that they need to be careful when picking the pieces up. After you collect all your pieces rinse them off with water and dry them very well. 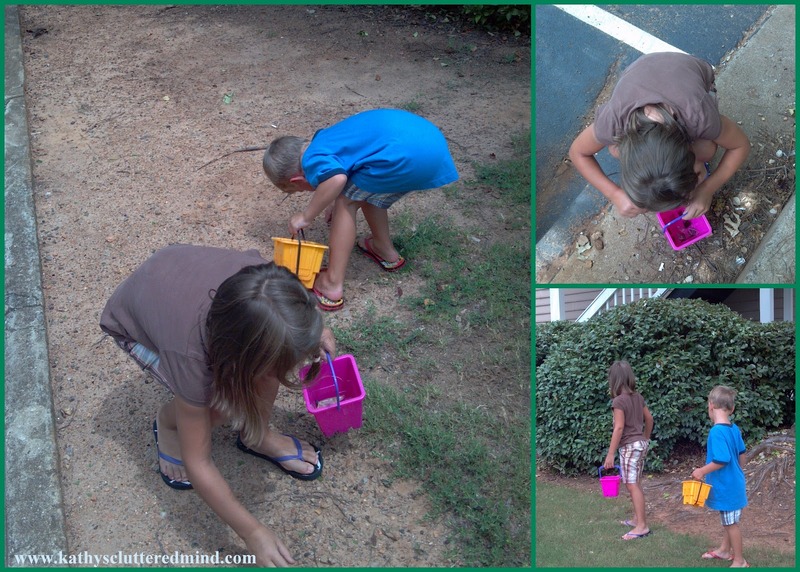 We discovered that our neighbors are BIG time litter bugs. 2. 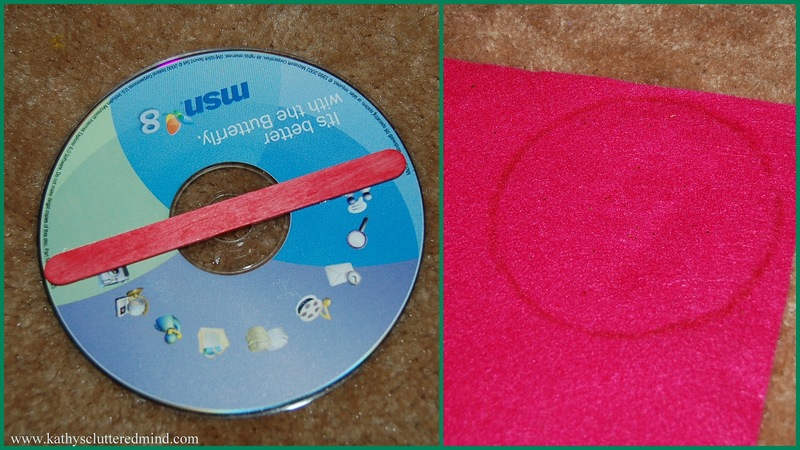 Glue a popsicle stick across the middle of the CD on the non shiny side. 3. Trace the CD on a piece of felt and cut out. Put this aside until later. 4. 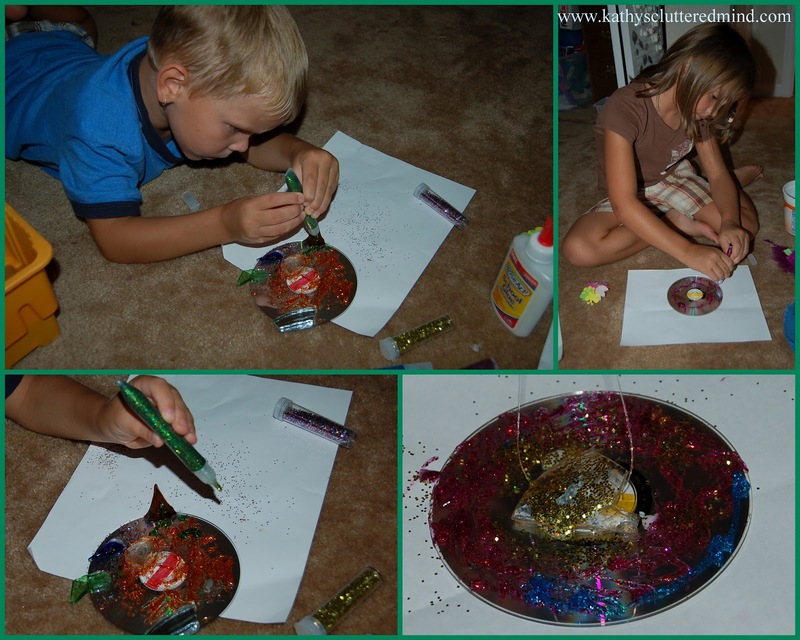 Decorate the shiny side of the CD using glitter, pompoms, glass pieces, foam stickers etc. My kids choose to use RoseArt Glitter Glue Pens, Glitter Shakers and pieces of glass. 5. Cut 5 pieces of fishing line at varying lengths. Glue as indicated below. 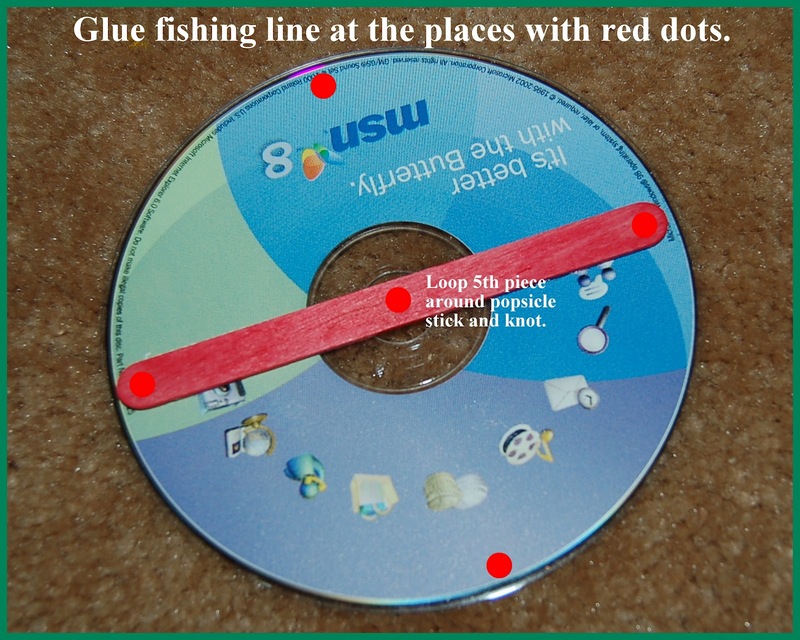 The fishing line in the middle should be looped over the Popsicle stick and tied in a knot and will hang down on the shiny side of the CD. 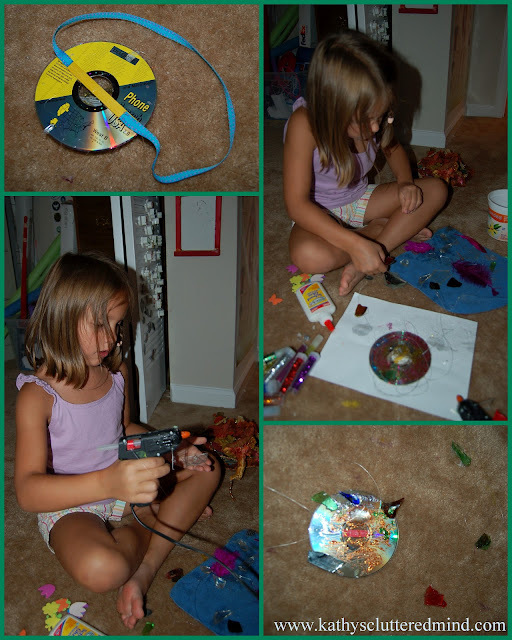 The other 4 pieces of fishing line will be glued to the non shiny side of the CD and will hang down over the edges. 6. Next comes the tricky part that will require adult supervision. Helping your child take two pieces of glass and decide where they will be placed. Place a dab of hot glue on 1 piece of glass and then place it onto the fishing line with the second glass piece on the other side. 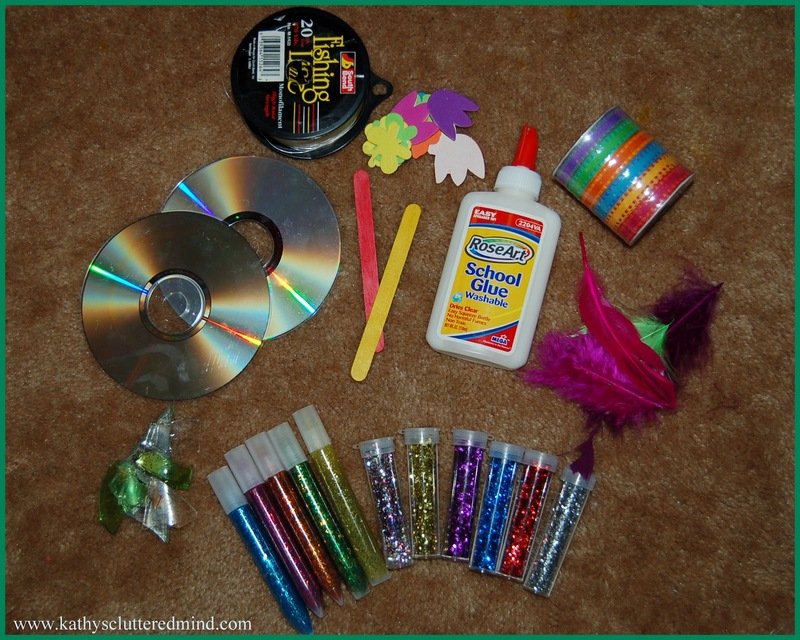 After you have placed all your glass pieces add some feathers for fun. 7. Now glue the ribbon hanger onto the CD - one end of ribbon onto each end of the Popsicle stick. 8. Lastly glue the circle piece of felt onto the top of the wind chime (the non shiny side). This will cover up the Popsicle stick, fishing line and ribbon ends which will also make them them more secure. 9. 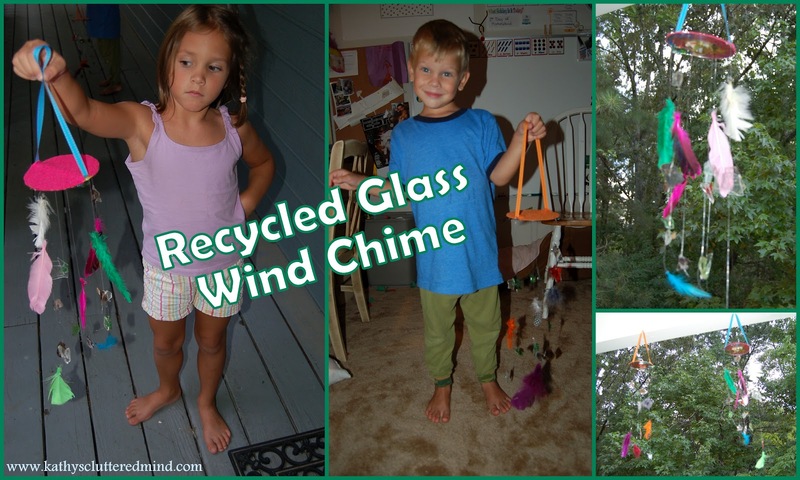 Now hang your Recycle Glass Wind Chime up outside and hear the beautiful noise the glass makes when the wind blows. You will also see a beautiful sight when the sun hits the glass pieces. 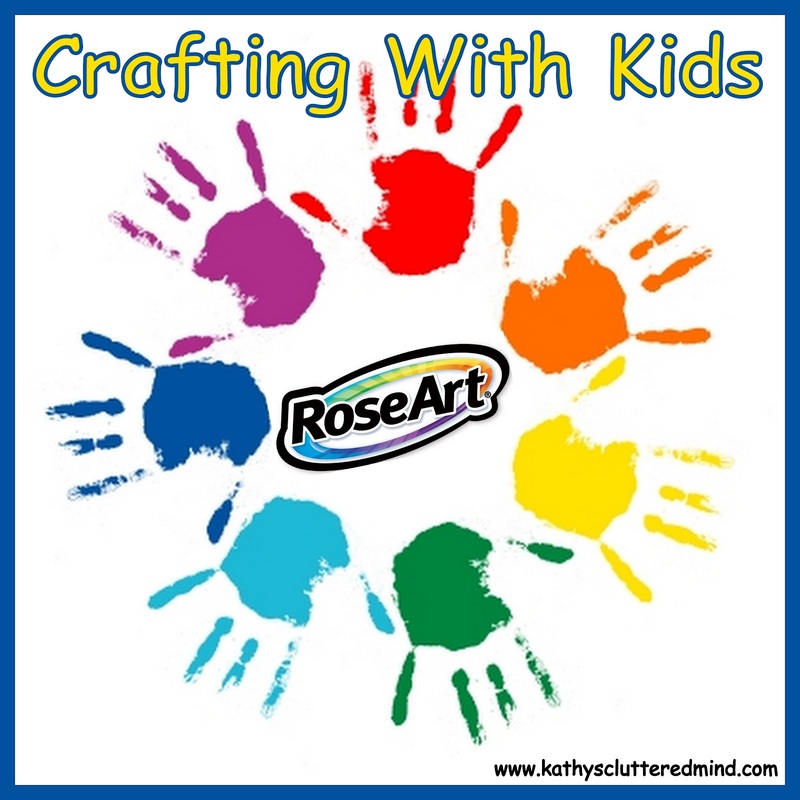 To buy these RoseArt products visit your local Walmart, Joann's, Target, etc or visit my RoseArt Amazon store. 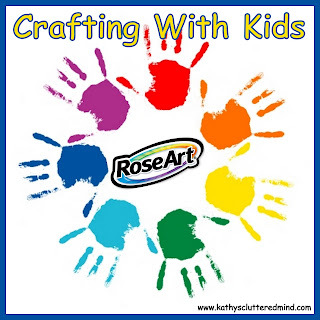 *Disclaimer - RoseArt (Mega Brand) supplies us with lots of wonderful products in return for honest reviews and craft project how to's. I was not compensated for my review and all opinions are our own! Many of the links found on my side bars and in my blog posts are affiliate links. As a result, I might get paid money and I will most likely spend the money on homeschool supplies.